Of course, the first week of January just has to be about using things up, eating healthier and of course, saving money on food. We were still on party mode on New Year’s Eve, and had a family feast/birthday party. on Monday, we just ate leftovers. On January 2, Alissa had her birthday. 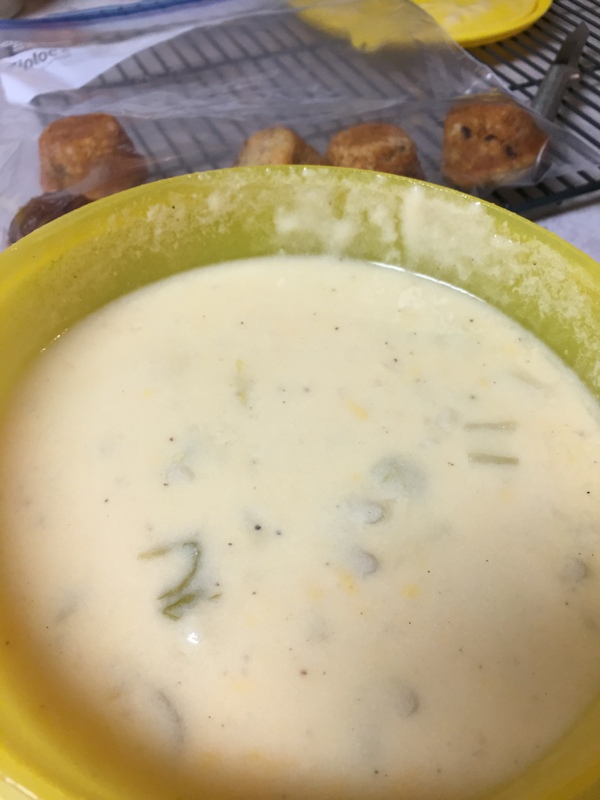 We made potato-cheese soup, her all-time favorite, and she enjoyed it that day, took some home, and we ate the rest here for a couple of days. 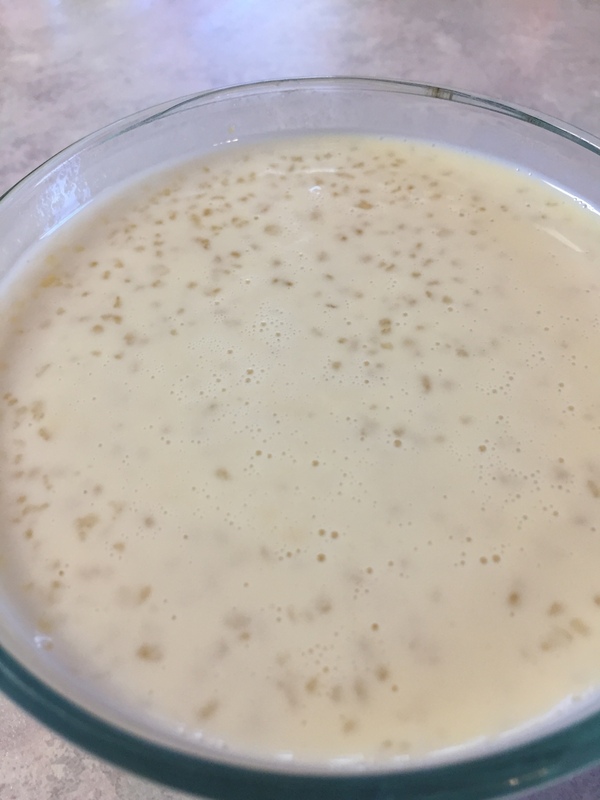 I made some tapioca pudding. 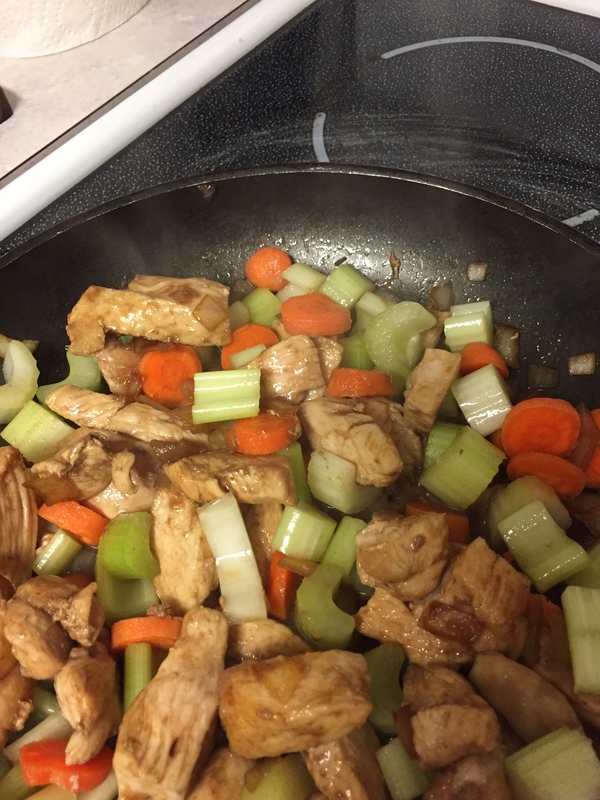 Last night, I made a simple stir-fry with celery, carrots, onion, chicken and soy sauce. I had leftover rice from Sunday, and made fried rice from onion, rice, soy sauce and a little pineapple. Seriously, that was all except salt and pepper. Very simple, used up things, and very tasty. I bought a 10-lb bag of carrots from Costco before Christmas, because they were under $5! So, I’m targeting carrots. Rob has been taking leftovers in his lunch now that he’s back to work, so the fridge is finally starting to clear out, but there is still plenty for tonight. We’ve eaten eggs, toast, tater tots, leftover dips and chips, and other things that needed to be cleared out or from the freezer or cupboard. I’ve spent under $20 on groceries this week so far, as we had so much to use up. For the next few days, I plan to use some beef broth I made a few days ago. I will make some kind of soup or stew from that, or use it in chili. I need bagels since Jake will be spending a few day, and that’s his food of choice. There is a great deal on cheese at Fred Meyers on Friday or Saturday (need to check) where 8 oz bags are only 99c. I will get those. I hope to jot down a few menu ideas in the next couple of days to give me ideas for the next few days, using other items that need to be used. How’s your January meal planning going? Everything looks so good and your reminded me of how much I love tapioca pudding. I have not had it in ages and now want some. 😉 We are trying to finish up leftovers here also. i just had some tortilla chips with purchased guacamole (hat someone brought) left over from a party, I have decided that I really do not like store bought guacamole…I want fresh! Be blessed and have fun with Jake! Your meals sound wonderful. Gluten-free chicken and dumplings are just not the same, but I still try now and then because I have always loved them! Thank you for the encouraging words! I love making leftovers and small bits into meals that are tasty–it’s almost like free food. Your stir fry looks delicious! I like the idea of lemon water to balance the chocolates! I should do that, myself! This year, the lemons on my trees are the size of limes, because I haven’t been watering them! I haven’t been doing much of meal planning, with daughter being home for the holidays, going out to eat, etc. But, my cousin gave me some leftover roast beef and I made stew with some of it. Will give half of what is remaining of the roast beef to daughter to take back with her. However, my plans for January is to eat from the freezer and pantry – there are things I should use up before I buy more! Good luck eating up your freezer and pantry excess! We are eating things up. too. I agree that your chicken stir fry looks delicious and so not holiday food that has gotten tiresome. I did a pot of minestrone soup on Tuesday and it was lunch all week and we even had friends over and ate bowls and bowls of it on Wednesday. I was glad to see the last of it today. Is it warm enough to drink lemon water outside there? That would be heavenly to be able to be outside in the sunshine! It’s not very warm, 40’s or maybe 50’s for a short time once in a while. The frosty mornings we had been experiencing have been replaced by overcast skies, or even heavy rain for the past few days, but, of course, that is above freezing. We are greatly affected by the Maritime Pacific air, even though we are over an hour from the ocean. So, it’s usually pretty mild here, with the temperature dipping below 30 only occasionally, and with rare snow. It’s never hot in January, but we are pretty used to it and I go outside year-round. That was just where I could get the best light to get a good picture. I did, however, carry my lemon water outside, into the car, to work, etc. for the last couple of days because I wanted to encourage myself to drink it! 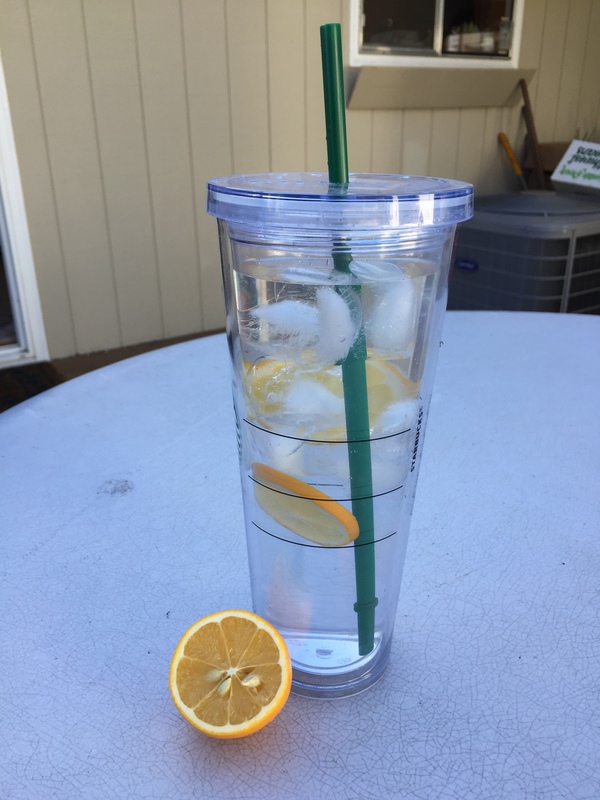 Your photo of water with lemon spurred me to pick up some lemons while I was grocery shopping today — I love that as a drink and it’s especially helpful when I am trying to reset to a healthier diet. All your meals look/sound yummy. Potato cheese soup sounds so comforting during this crazy cold snap! Last winter, we had record snow for our part of Oregon. This year….today, it felt like spring out there and we did not build a fire until evening. Then, I look at the news, and the rest of the country is freezing! I hope you stay warm if you are in one of those cold parts! Lemon water is so inexpensive, and so good for me. I love drinking it, too, year-round when I remember to buy lemons. I don’t like cold, either. Living my entire life in the part of Oregon that has mild temperatures, we moan and groan if there is an inch of snow:). But, I think Florida would be warmer most of the time, so you would feel the contrast even more! Great ideas! I’m with you on this venture of starting new and saving money! Let’s support each other! Great idea–the more like-minded people on the same page, the more encouragement! I can always get good ideas from other people.